Squadron Leader Jack Archer, D.F.C., A.F.C., 46394, 578 Squadron, Royal Air Force. Jack Archer was born in Ossett on the 21st June 1912, the son of book-keeper George Earl Archer and his wife Florence Robinson who had married All Saints Church, Dewsbury in June 1911. Jack Archer joined the Royal Air Force, probably near the start of WW2 and in June 1940, he married Marion Lockwood in the Lower Agbrigg Registration District, which at that time included Ossett. It is likely that there were three children: Stuart Archer born in 1941; Patricia M. Archer born in 1943 and Sheila Archer born in 1947. In 1942, whilst a Pilot Officer, he was awarded the Air Force Cross. In 1945, now with 578 Squadron, a Halifax heavy bomber unit based at RAF Burn, near Selby, he was awarded the Distinguished Flying Cross. 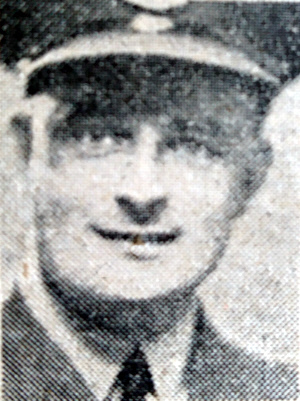 "Further Honour For Ossett Officer - Among the recipients of awards made this week is Acting Squadron Leader, Jack Archer (Ossett) who gained the D.F.C. A native of Ossett, he was educated at South Ossett C. of E. School and Ossett Grammar School. His parents are Mr. and Mrs. G.E. Archer, of Poulton, Blackpool and formerly of Horbury Road, Ossett. He was awarded the Air Force Cross in the King's Birthday Honours in 1942 for continuous courage and devotion to duty." 578 Squadron was formed on the 14th January 1944 at Burn, near Selby. Bomber Command was expanding rapidly when the newly formed 578 Squadron arrived at RAF Burn in February 1944 with its huge four engined Halifax aircraft. Soon, aircrew and ground staff were to outnumber the local population by about ten to one. During its fourteen months of occupation of RAF Burn, the Squadron flew 2,722 sorties against the strongly armed enemy, suffering grievous losses of aircraft and 219 aircrew but making a substantial contribution to the final victory. Few operational Squadrons can have excelled the record of that of 578 in so short a period, during which its aircrews earned 79 Distinguished Flying Medals, 144 Distinguished Flying Crosses, 2 Distinguished Service Orders and the ultimate recognition for valour, the Victoria Cross, awarded posthumously to Pilot Officer C. J. Barton, the only Halifax Bomber pilot to be so honoured. The President of the United States of America ordered the posthumous award of the Silver Star for Gallantry in Action to the first Commanding Officer, Wing Commander DSS Wilkerson DSO, DFC. After WW2, in 1947, Jack Archer was transferred to the Aircraft Control Branch of the Royal Air Force. After retirement, he and his wife moved to 41, Boroughbridge Road, Northallerton and Jack Archer died there on the 8th September 1995. 1. "Ossett Observer", Saturday, May 5th 1945.